Float away in a dreamlike state of peace and tranquillity. Daydreams is a wonderfully tranquil composition that is perfect for meditation and deep relaxation. Slow moving sounds swirl around a backdrop of forest birdsong, while the delicate sound of chimes sprinkled lightly throughout the music create a sense of lightness and purity. 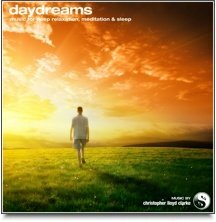 Daydreams is an extraordinarily serene musical creation that will leave you feeling utterly relaxed and at peace.